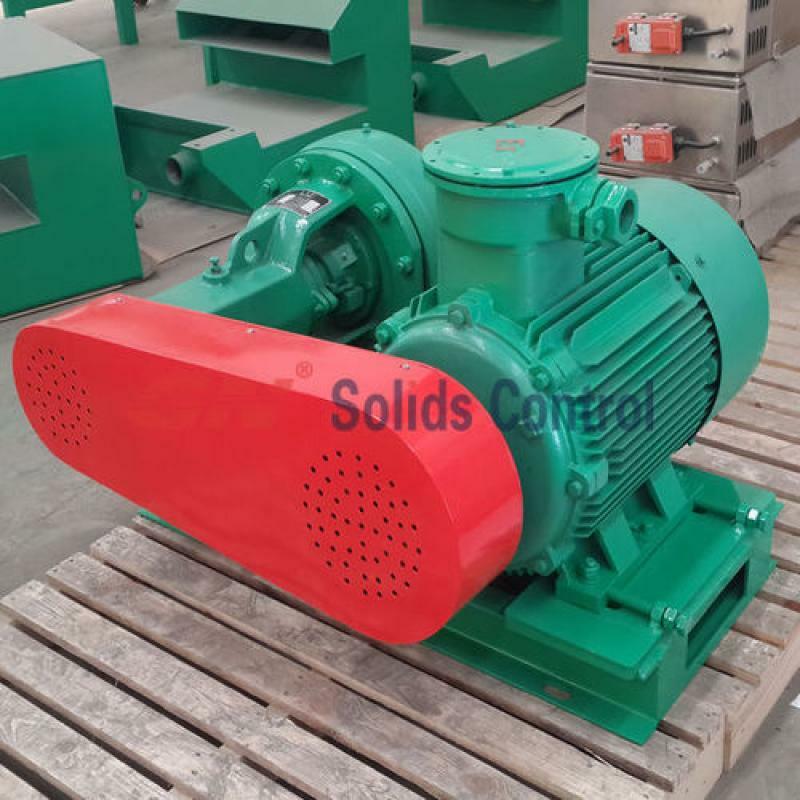 As China top manufacturing on mud solids control and drilling waste management, GN Solids Control exported complete set solids control equipment for Russia customer. 1) Solids control shale shaker with linear motion, model GNZS594E. Model clarification: GN means brand. ZS means linear motion. 59 means the screen width is 59cm. 4 is 4-panel screens. E means it is the E generation from GN Solids Control. 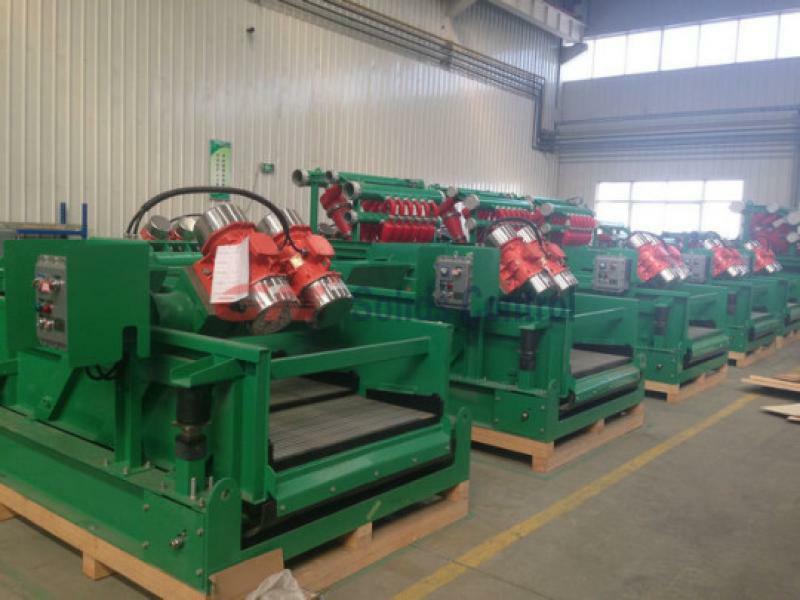 It is a 4-panel linear motion shale shaker can be used for both solids control. It can also be used as high G drying shaker while equipped with 1.94Kw vibration motors and with hopper feeding. GN offers steel frame screen and composite material screens for GNZS594E 4-panel shaker. 2) Fixed speed decanter centrifuges for solids control and barite recovery. Centrifuge model: GNLW363CG. It is the most popular side decanter centrifuge for drilling rigs. GN and LW means the brand and centrifuge type. 36 is the centrifuge bowl diameter: 36cm. 3 is the bowl length and diameter ratio. 3 is the most popular ratio for drilling rig decanter centrifuges. 3) Some mud agitators and centrifugal pumps. Even for the accessory small equipment, GN all made per international high standard, with all materials chose from internal and international famous brand. For mud agitator, GN chose SOG oil seal and FAG genius bearings. GN centrifugal pump is equipped with mechanical seal. The material for mechanical seal is tungsten carbon for long time. Bearings are from worldwide famous brand FAG. 1) Desander, desilter or mud cleaner with under flow shale shaker. GN do offer 2-panel, 2-panel, and 4-panel under flow shale shaker. 2) Poor boy degasser, it is also name mud gas separator. It is used before shale shaker but after BOP to kill the gas in the mud. 3) Vacuum degasser. It is used after shale shaker but before hydrocyclone separator to kill the very small size gas to protect the cones. 4) Jet mud mixer for barite and polymer mixture. Oilfield screen shaker separator normally called oilfield shale shaker or screen separator. It is the first step solids control equipment used in oil field and other drilling activities. It is the necessary solids control equipment for mud systems, no matter for oil and gas drilling, HDD, CBM, TBM, or piling. Per the motion type of screen shaker separator, there are linear motion screen shaker separator and balance elliptical motion screen shaker separator. Oilfield screen shaker separator is normally linear motion type. And linear motion screen shaker separator is the most popular and long history type. Linear motion is more reliable. It can suits more kinds of jobsite condition. While Balance elliptical screen shaker separator is very limited with jobsite and mud condition. When there are big load of mud, or the mud fall onto screen shaker deck unequally, the motion will be damaged and the BEM shaker cannot be working well. Mud will be over flow. Per shaker deck quantity, there are single deck screen shaker separator and double deck screen shaker separator. Double deck screen shaker separator can be used for scalping shaker separator. The top deck use coarse mesh screen for pre-separation, while the bottom deck use normal mesh wire screen per jobsite condition. Per the difference of applications and G force, screen shaker separator can be divided into solids control screen shaker separator and drilling waste management high G screen shaker separator. Beside the application G force is different, for solids control screen shaker separator and drilling waste high G force screen shaker separator, the feeding type of the 2 screen shaker separator is also different. Solids control screen shaker separator is normally use top type or back type weir feeder, or box feeder, while drilling waste screen shaker separator is use hopper feeding. Solids Control screen shaker separator can be fed by slurry pump or fed directly from the rig manifold under gravity. While drilling waste screen shaker separator can be fed by screw conveyer or cuttings transfer pump. GN Solids America, it is the branch company of GN Solids Control Company Limited. It is located in Houston Texas. With its own office building and warehouse. GN Solids Control and GN Solids America took part in 2015 OTC oil show with great success. 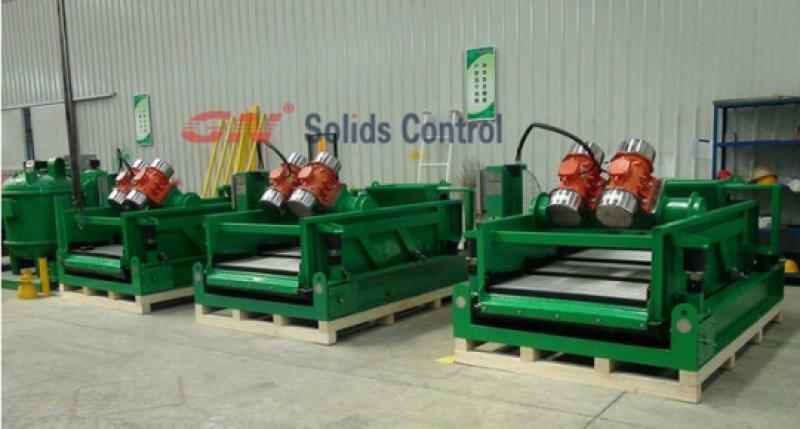 The head company GN Solids Control takes its latest design drilling waste management equipment (high speed decanter centrifuge, vertical cuttings dryer) for the show. 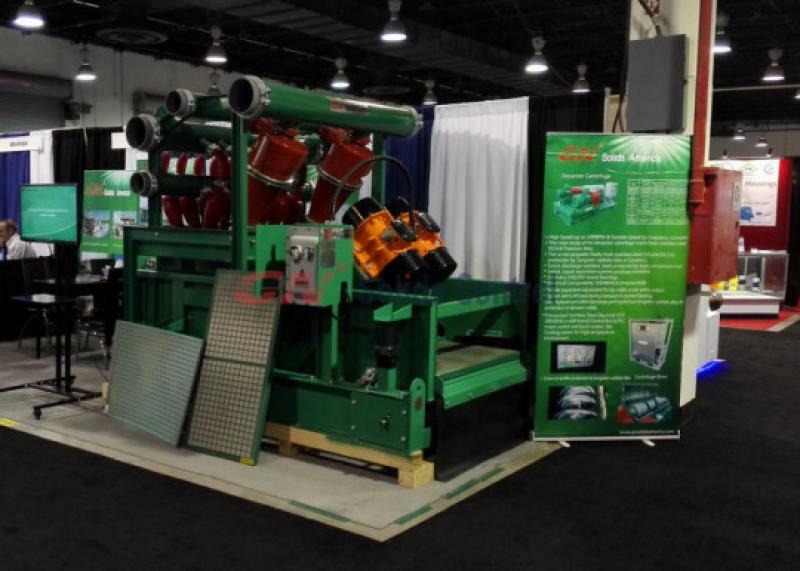 And GN Solids America show the mud cleaner separator machine for the OTC oil show. Mud cleaner is a 3-in-1 machine, with the function of desander, desilter, and a under flow shale shaker. It is the combination of under flow shale shaker GNZS594E, a 2-cone desander, and 12-cone desilter. The capacity of mud cleaner depends on the desander cone and desilter cone capacity. The smaller one is the treating capacity of the whole treating capacity. Desander cone and desilter cone is on D100 separation machine. There will be some amount of useful mud discharged together with dirty mud. 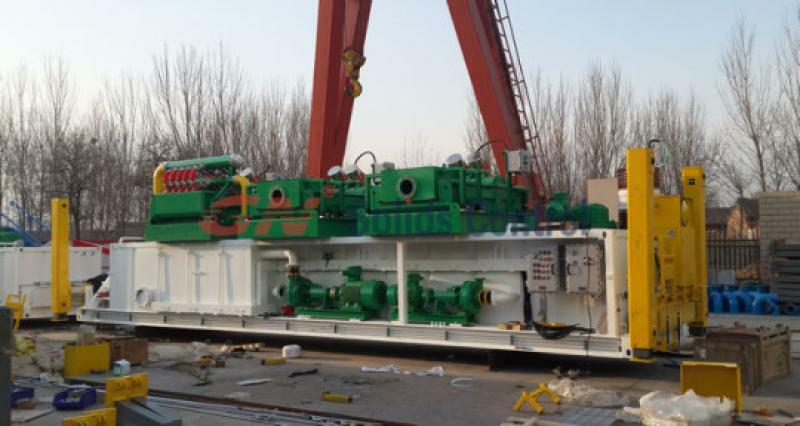 So the function of underflow shale shaker is to further treat and recovery mud and dry the solids discharge. Some jobsite may use desander or desilter with not under flow shale shaker to save cost. But the performance is surely not as good as the combined one. 3) Feeding pipe size of the mud cleaner is 6’’ and the output size if 8’’. GNSB8*6 centrifugal pump is mostly used to feeding for the desander and desilter. 4) Shaker screen of the GNZJ594E-2S12N mud cleaner: the under flow shale shaker is a 4-panel shaker with long shaker deck. It can make the solids more dryer. The shaker screen is pretention type, and mounted with wedge for fast screen changing. 5) GN patent design for Synchronous adjusting of the deck angle. When the operator adjust shaker angle at any side, both sides will be up or down with exactly the same angle. It saves time of jobsite people and easy for operation. trough to lead the fluids to other tanks or other place, no need extra pump. fluids will be transfer to desander or desilter separation by centrifugal pump. solids control system, and the recovered barite can be reused in the system. the hopper of jet mud mixer and come to the system again. Shear pump is a kind of centrifugal pump no need safety valve at outlet. Below is reasons explained from function and pressure source. Shear pump is a kind of centrifugal pump. Drilling mud get a certain amount of kinetic energy while leaving impeller under the impeller rotating centrifugal force. Mud also get some certain of pressure in the pump housing, the pressure does not vary with the change of time, pump outlet size, but only depends on impeller structure, size, and rotating speed. As the pressure at shear pump outlet is not vary per pump flow or working condition. It is no need to match safety valve. Driving motor and shear pump connected directly with belt. Design speed of impeller is 2200RPM (max.). Under normal working situation, like for 60hz motor, max. speed of shear pump impeller is 1800rpm, much smaller than the design speed. The maximum pressure generated from high speed rotating of impeller centrifugal force is constant. The max. shear pump pressure is 0.47MPa. The outlet pipeline and pump casing can surely withstand the pressure. In this case, it is no need to match safety valve. Even in the case of the outlet is blacked or the valve is closed, pressure generated from the impeller rotating is larger than pump outlet, drilling mud cannot be discharged, and circulated within pump housing under the rotating force of impeller. If the outlet is blacked or the valve is closed, and mud circulated within the pump housing for a long time, the worst condition is to increase the temperature of pump housing in some degree. The pump pressure will not increase. Therefore, it is no need for mounting safety valve in shear pump outlet pipe.